Mardi Gras is a fun time of year whether you're celebrating in the Big Easy or at a local celebration far from the Fat Tuesday crowds. I recently talked to Shari McConahay of the Extreme Halloween Network, which includes MardiGrasCostumes.com, about Mardi Gras costumes and how you can get in the Mardi Gras Spirit. LovetoKnow: What are some of the most popular Mardi Gras costumes? 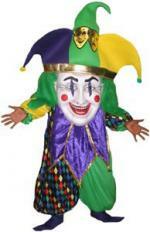 Shari McConahay: Every year the classic and traditional Mardi Gras costumes are jesters and clowns. And, of course, masks are always a popular symbol of Mardi Gras and an easy way for anyone to participate in the festivities. However, each year different themes can become popular, such as pirates. 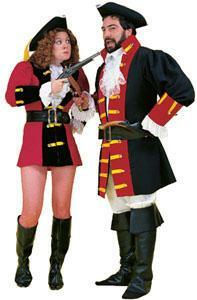 The pop culture influence of pirates has also infiltrated the Mardi Gras costume scene. I think this is especially true in coastal regions (such as New Orleans), where pirate legends have ruled the seas for hundreds of years. New designs incorporate the Mardi Gras trinity of colors into pirate style costumes, so look out for purple, green and gold pirates this Mardi Gras! Our Buccaneer King and Queen matching couples costume comes in Mardi Gras colors, and our sequin Captain Hook Costume will dazzle up any float or parade. LTK: Are there any new costumes this year that you're excited about? SM: Besides the pirates mentioned above, we have a new jester costume that rocks! He is called the Oversized Jolly Jester and is just as cute as can be, ready for any parade or celebration. This costume features a giant oversized head and the person inside looks out of the comedy and tragedy masks at the top of the head. I am also excited about all of the beautiful masks that are available. There are feathers, sequins, glitter and fabulous materials in any and all colors of the rainbow! Many of the ones we carry are hand made, so no two are exactly identical. LTK: What makes a good Mardi Gras costume? SM: I think the person inside the costume and their personality are really what makes a costume. It is really important to remember that there are no restrictions for a Mardi Gras costume. You can be whatever your mind can imagine and anything will fit in with the Carnivale party atmosphere! LTK: Do people with better costumes tend to get better throws? SM: I am sad to say I have never made it to New Orleans for an official Mardi Gras celebration, so I can't speak from first hand knowledge. However, in the many parades and costume events I have been to I think it is the costume and personality or actions of a person inside the costume that will get them more throws. So, having a great costume is only part of the equation for receiving better throws. LTK: Your site has a lot of "naughty" costumes, which are a lot of fun if you're into that sort of thing. Do you think people are willing to be a little naughtier for Mardi Gras than they might be for Halloween? SM: Well, for sure, the costume industry styles are getting sexier and skimpier each year, we try to maintain a balance of costumes for everyone while still having cutting-edge styles. Both Halloween and Mardi Gras are a wonderful time for people to let go of their inhibitions, be somebody that they normally might not be, which is great as long as everyone around are consenting adults! We have a costume that pokes a little fun at the Mardi Gras wild phenomenon without being Rated R. It is called "Chicks Gone Crazy " and features a tank top with a black "censored" mini tank underneath it. LTK: For those of us who can't travel to Louisiana this year, what can we do to throw a great Mardi Gras party? SM: You can be anywhere and have an awesome Mardi Gras party! (And it can actually be anytime of the year!) Many restaurants and bars have Mardi Gras parties that are open for anyone to attend, but there is no reason why anyone can't throw their own party. My ideas for this theme are endless! You can have a costume (or just a mask) required affair or a full-on masquerade ball is always a fun chance to reuse your New Year's formal wear or bridesmaid dress-just add a beautiful mask to the ensemble. You can send out invitations printed on or attached to Mardi Gras eye masks. Decorations are available through us online or at plenty of local party supply stores. Get some recipes together for Mardi Gras madness frozen delight drinks, some spicy jambalaya, and King Cakes and you are set for an event to remember! LTK: What's your favorite thing about Mardi Gras? SM: My favorite thing about Mardi Gras is that it's another chance to dress up and have fun with friends. LTK: Why is Mardi Gras such an important holiday? SM: For many people, Mardi Gras is an important party of their religion and family traditions. For me, Mardi Gras is important because it is a piece of our American history, culture, and pop culture. It is also important because people need a release in their busy, fast paced lives. Mardi Gras is a time to relax and party a little and nowadays people are so caught up in the humdrum of everyday life, we should welcome any excuse to live a little and have some fun! Interested in finding more ideas for Mardi Gras or your next masquerade ball? Check out these great articles!